❷ What’s behind Israel’s call for ‘economic peace’? Israeli troops used tear gas to suppress a march held by five Palestinian food production companies on Sunday near the Israeli Ofer prison in the occupied West Bank. ___The companies protested by parking their trucks near the prison, after Israeli authorities banned their products from entering Jerusalem and Israel. . . .
___Israel informed the companies on Wednesday that their products were banned from entering Jerusalem through the Beitunia commercial crossing. MORE . . .
Gen. Gadi Eizenkot, the Israeli military chief of staff, gave the Israeli Cabinet a periodic security briefing Feb. 21. According to press reports, Eizenkot expressed concern over the deteriorating political situation within the Palestinian Authority (PA) and the continuation, for six months by now, of almost daily terror attacks by individual Palestinians. He recommended to the Cabinet that the economic situation in the West Bank be ameliorated, primarily by allowing a greater number of Palestinians to work in Israel. MORE . . .
Palestine Liberation Organization Executive Committee member Hanan Ashrawi conducted a series of meetings this week in Washington, D.C., to discuss the latest political developments in the occupied Palestinian territory and the escalation of Israeli violations of international law, a PLO press release said on Saturday. ___In a meeting with US officials working on the Israeli-Palestinian conflict, Ashrawi called for the United States to support an initiative to organize an international peace conference launched by the French foreign ministry in January. ___She provided a briefing on the deteriorating conditions in the Gaza Strip . . . . MORE . . .
Sixteen Palestinian journalists are currently being detained by the Israeli occupation authorities, the Palestinian Prisoners’ Club has revealed. ___In a statement to Anadolu, the organisation said that the Israelis arrested Farouq Aliyat, the director of Palestine Today TV . . . The correspondent of Al-Fajr Al-Jadid TV, Sami Al-Sa’e, was arrested. . . .
___ According to the prisoners’ group, nine journalists are serving prison terms inside Israel, three are being held without charge or trial under administrative detention and four, including Aliyat, are still being detained on remand. MORE . 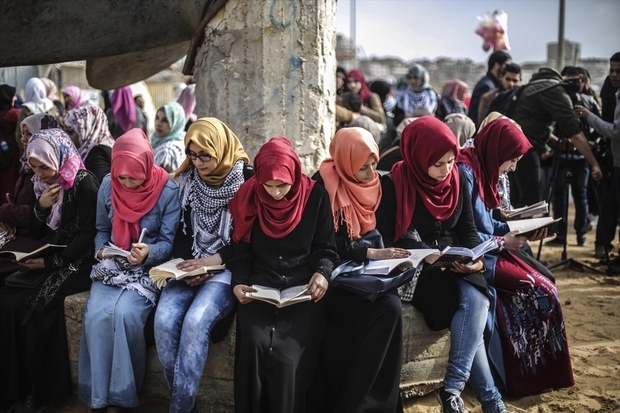 . .
Palestinians in Gaza read books as they stage a demonstration called ‘Gaza reads’ against Israeli violations in West Bank and Jerusalem, on 3 March, 2016 (Photo: Middle East Eye―AA). By deporting Palestinians to Gaza, Israel would officially be admitting, for the first time, that the besieged Strip is a prison, the largest in the world. ___An hour’s drive from Tel Aviv: a ghetto. Possibly the largest ghetto in the world, with about two million people. The latest figures from Gisha, Legal Centre for Freedom of Movement (an Israeli NGO): Gaza unemployment is at 43 percent; 70 percent of Gazans need humanitarian assistance; 57 percent live in the shadow of food insecurity. MORE . . . The Israeli authorities have denied entry to Indonesia’s foreign minister, who was scheduled to visit the occupied Palestinian territories. . . .
___”The Israeli occupation authorities prevented today morning the Foreign Minister of the Republic of Indonesia Ms. Retno Lestari Priansari Marsudi and her delegation from entering Palestinian territories,” said a statement by the Palestinian Foreign Ministry on Sunday. 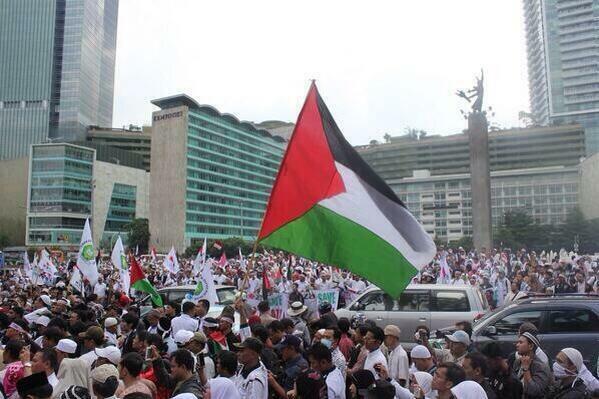 ___The Indonesian official was set to make an official visit to Ramallah . . . .
___ Indonesia, the world’s most populous Muslim nation, is a staunch supporter of the Palestinian struggle for nationhood and has no formal diplomatic relations with Israel. MORE . . . I prefer my mother’s sadness. with laurel and a royal display! I prefer my mother’s palm. or a street and public garden! and grow into a vineyard and farm! by giving a speech each year in my honor!